Moving averages are one tool to help you detect a change in trend. They measure buying and selling pressures under the assumption that no commodity can sustain an uptrend or downtrend without consistent buying and selling pressure. A moving average is an average of a number of consecutive prices updated as new prices become available. The moving average swallows temporary price aberrations but tells you when prices begin moving consistently in one direction. Trading with moving averages will never position you in the market at precisely the right time. They are intended to help you take profits from the middle of the trend and hold losses to a minimum. The risks and the magnitude are intrinsic to the speed of the moving averages. Professional traders lean toward the faster averages and portfolio managers generally prefer slower signaling moving average approaches. Moving averages are a simple way to gauge the direction the tide is flowing in a commodity market. They are not always right, but they provide a wide variety of possible uses. Moving averages lag prices because of their makeup. You can make a moving average for any number of days you choose, but remember that the more days you average, the more sluggish the moving average becomes. Most commodity traders find a 3-day moving average alone is too volatile. However, 4-day and 5-day moving averages are common as short-term indicators. To start a 4-day moving average, add the last four days' closing prices and divide by four, The next day, drop off the oldest price, add the new close, and divide by four again. The result is the new moving average. Use the same system for any moving average you might want to develop. Moving averages give signals when different averages cross one an- other. For example, in using 4-day, 9-day and 18-day moving averages, a buy signal would be given when the 9-day average crosses the 18-day. However, to avoid false signals, the 4-day average should be higher than the 9-day. Just the opposite is true for sell signals. 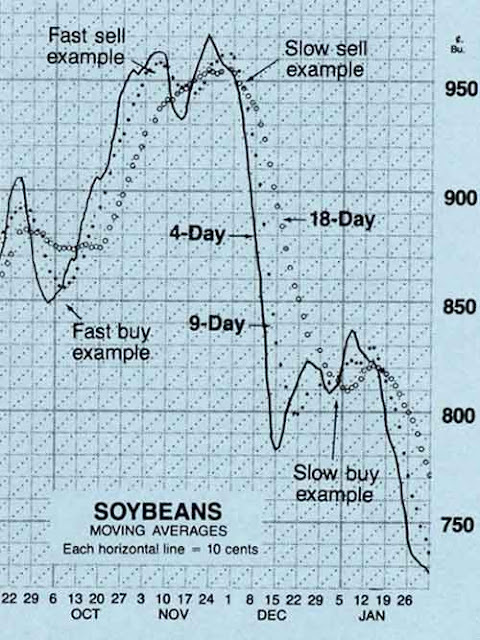 To sell, the 4-day average must be below the 9-day. 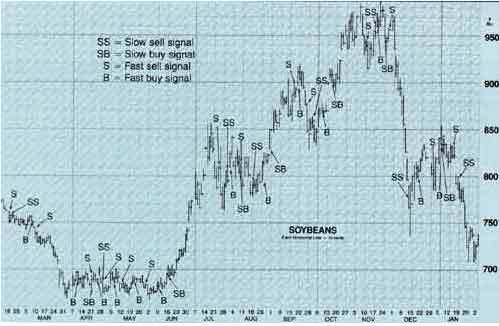 The sell signal is triggered when the 9-day average crosses the 18-day. There are other conditions you might wish to place on your averages to avoid false signals. 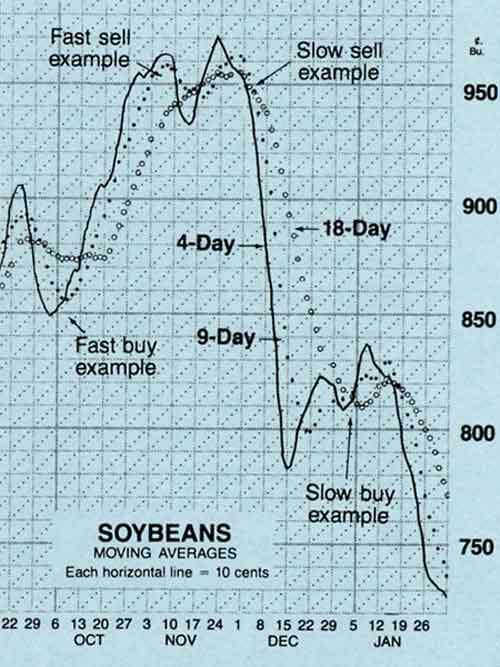 One possible requirement is to make the 4-day exceed the 9-day by a certain percentage before acting on the appropriate buy or sell signal. The caveat to moving averages is that although they work well in trending markets, they may whipsaw you in a sideways, choppy market. It helps to "tune" the moving averages to a particular market. A bit of brainwork is necessary to use a moving average. You can use the moving average studies on MarketClub streaming charts to find whether a fast or slow moving average is best for your trading style. Some traders who use moving averages follow the slower moving average signals to initiate a position but a faster moving average to exit the trade, especially if substantial profits have been built up. A linearly-weighted moving average also could help eliminate false signals. A 4-day linearly-weighted moving average multiplies the oldest price by four, the next oldest price by three, etc., and divides the total by 10. This weighted average is more sensitive to recent prices than a standard average. The term, "linearly-weighted," comes from the fact that each day's contribution diminishes by one digit. The rules for trading a weighted moving average are the same as using a combination of three moving averages. The weighted average must be above or below the other moving averages, or the signal is ignored. A more sophisticated average is the exponential moving average, which is weighted nonlinearly by using a specific smoothing constant derived for each commodity to allocate the weight exponentially back over prior trading days. During the week of October 10, the 4-day average and 9-day average both crossed above the 18-day average giving a buy signal. Also note that the 4-day average was above the 9-day average, giving further indication that this was not a 'false' signal. During the week of November 14, both the 4 and 9-day average crossed below the 18-day average - with the 4-day average also moving below the 9-day average - giving a sell signal.